I just love rainy days! They are so perfect for creating your own little masterpieces. This card was done for a wedding my son was attending today. It turned out so beautiful in real life. Too bad the scans don't do it any justice. 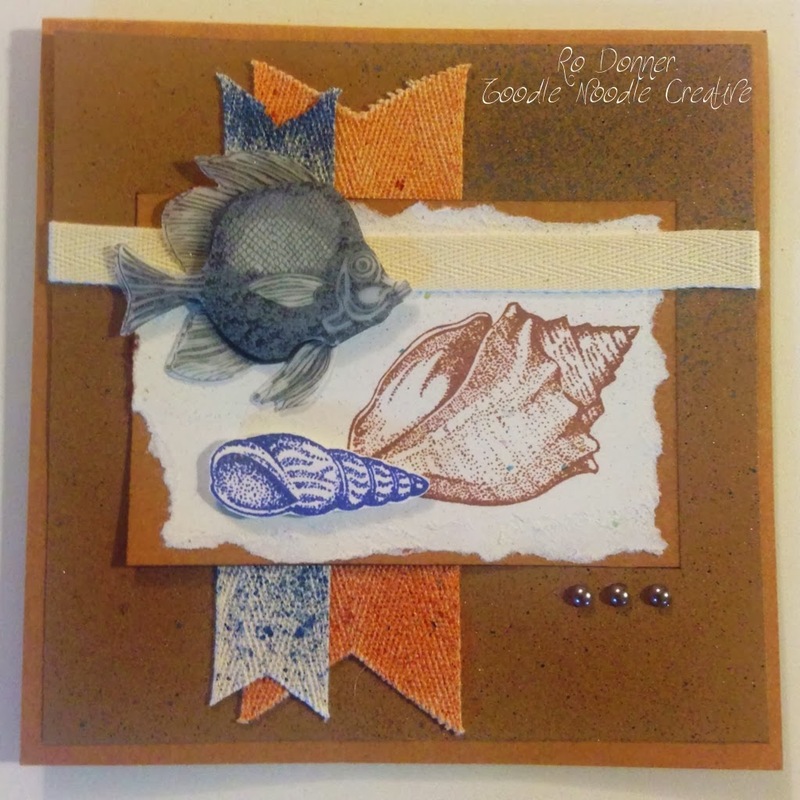 I used the Naturals Ivory CS for the card itself and under the stamped images. I used So Saffron and More Mustard for the layers. 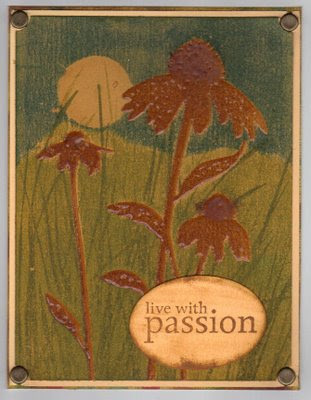 I embossed the images using the Upsy Daisy (front) and Heard from the Heart (inside) SU! stamps. The ribbon and clear stones were purchased a while ago and I have no clue who made them or where they came from (helpful, right?). 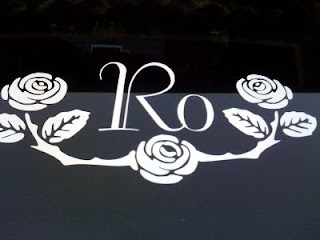 I also used Moon Glow Two-Toned embossing powder in Terra Cotta Plum. The images look so rich. I used a Versamark pen to draw an outline around the edge of the card and embossed that as well. This card is so pretty IRL I almost hate to give it away...almost. This next card I actually did last night (it was raining then too). I used the new SU! In Colors (Kiwi Kiss and Tangerine Tango) for both cardstock and ink. 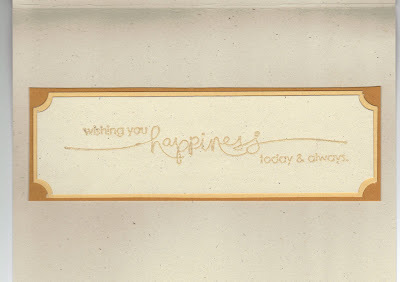 I also used the Naturals Ivory for the card itself and under the stamped images. I am going through a Naturals Ivory phase. White just seems so stark for this rainy season and the ivory is much softer. I cut a strip of the Tangerine Tango cardstock and cut three slits in three columns to slide the stamped image through. I didn't have any matching ribbon, so I rigged up something a little different. Necessity is the mother of invention, right? I really like the way it turned out. 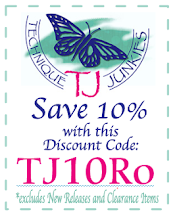 I used the Organic Grace stamps for this one. I used the fern with Versamark on the background. The flower and dragonfly were done with the Tangerine Tango. 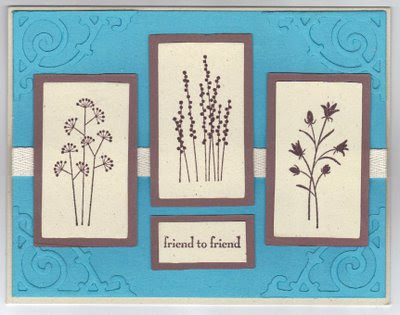 I just love the way the Friend to Friend card turned out. I used my new Big Shot to die cut the rectangles and corner images (Sizzix Architecture #4). I used Tempting Turquoise, Chocolate Chip and (of course) Naturally Ivory Card Stock. The ink was Chocolate Chip. I used a strip of the SU! Twill Tape behind the images. The stamps were from the new Pocket Silhouettes set. The Live with Passion card was actually inspired by Michelle Zindorf (my new idol...I'd probably stalk her if I lived nearby [don't worry Michelle, I'd be very harmless]). 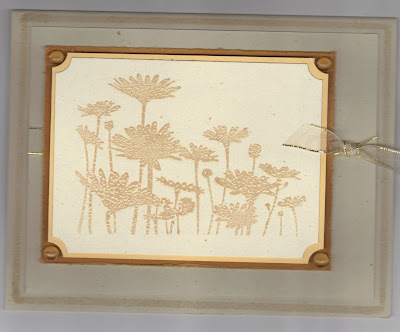 I embossed with clear embossing power the Inspired by Nature flowers on More Mustard CS. I punched out a Post-It circle for the moon and stuck it down. I brayered (is that a word?) the sky in Not Quite Navy, removed the Post-it, and brayered the ground in Old Olive. I then overstamped the grass (Kiwi Kiss ink) and punched the corners. 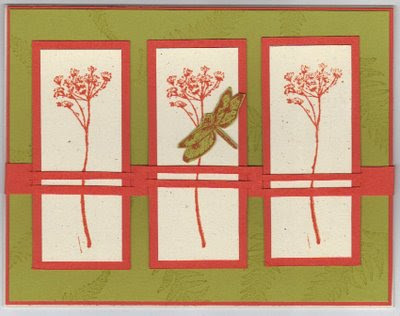 That was layered onto the So Saffron Cardstock and attached to the card base (some old, ugly prefolded card). Not sure where the brads are from. More stuff from my stash. Well, it's still raining, so I think I'll play just a little bit longer while the inspiration is still there. I have to clean my house and stuff, but just can't quite get myself in that mindset when I have all these ideas running through my head.